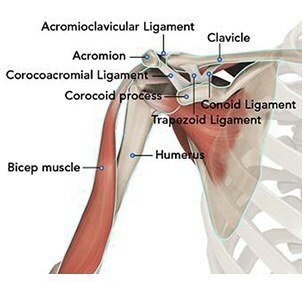 Although there is no cure for arthritis of the shoulder, there are many treatment options available. Using these treatment options, most people with arthritis can manage pain and stay active. 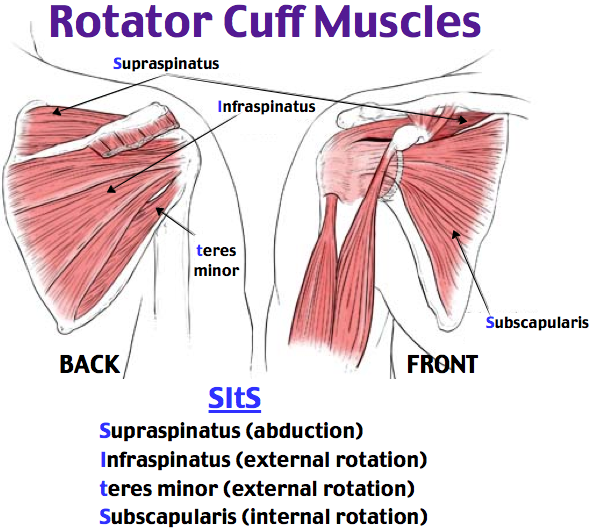 The inside layer of muscles gives the shoulder stability and motion above shoulder height and is called the rotator cuff—a series of 4 muscles. Because of the necessity for the rotator cuff to stabilize the ball of the humerus, an anatomic or standard shoulder replacement is indicated when arthritis of the shoulder is coupled with an intact rotator cuff. This combination is the most common in patients with osteoarthritis. Rheumatoid arthritis is an autoimmune disease. This means that the immune system attacks its tissues. In RA, the defenses that protect the body from infection instead damage normal tissue (such as cartilage and ligaments) and soften bone. Patients report pain and limitation in raising the arm with shoulder osteoarthritis. This greatly limits the function of these patients—many are unable to get a glass from a shelf, comb their hair or reach across the table to grab the salt shaker. Pain may be worse at night and interfere with sleeping. X-rays can determine the amount of arthritis associated with the disease. Typically x-rays from multiple angles better discern the amount of arthritis. Patients with chronic rotator cuff tearing may exhibit changes in relationship of the ball and socket which indicates a massive chronic tear with a high riding humeral head. 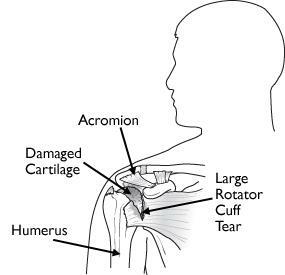 Patients with an intact rotator cuff typically have a head centered on the glenoid. Enhanced imaging of CT or MRI may be used to further image bone for reconstruction. MRI may be used to evaluate the status of the rotator cuff when it is unclear regarding the rotator cuff integrity. In intact rotator cuff is typically required for anatomic shoulder replacement. Initial management for shoulder arthritis mirrors osteoarthritis in other joints. First line treatment includes the utilization of anti-inflammatory medications (Advil, Aleve). Tylenol may help patient with pain and may be utilized concurrently. For many patients, heat is a useful adjuvant to improve pain. 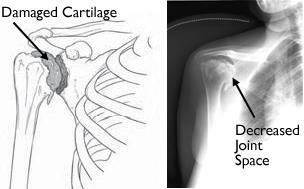 For patients with continued pain, a steroid injection of the shoulder joint may be indicated. These injections may be done in connection with mediations listed above. The role of physical therapy for shoulder arthritis remains unclear. Typically, shoulder steroid injections may be repeated 2-3 times per year. Risks with injection include depigmentation, tendon rupture, and infection. For patients with continued pain and poor function, shoulder arthroplasty is an option. Results are shown in some studies to correlate with surgeons who do a considerable volume of shoulder replacement every year. The anesthesia choices include regional or general anesthesia. Incisions are required to place hardware for the reverse procedure into position. Dissection to identify nerves and bone landmarks usually makes these procedures done in a hospital setting—although outpatient surgery is reported with good outcomes. Surgery is typically performed with a nerve block and supplemental anesthesia. Surgery typically requires less than two hours and the risks of blood transfusion are 1% in most studies. The need for medical prevention of deep vein clots after surgery is controversial and ranges from none, to aspirin, to mechanical compression to blood thinning agents. Other standard risks associated with surgery and arthroplasty apply to these types of procedures. The type of replacement differs for the source of the arthritis. Typically, osteoarthritis with an intact rotator cuff is treated with a standard (anatomic shoulder replacement. 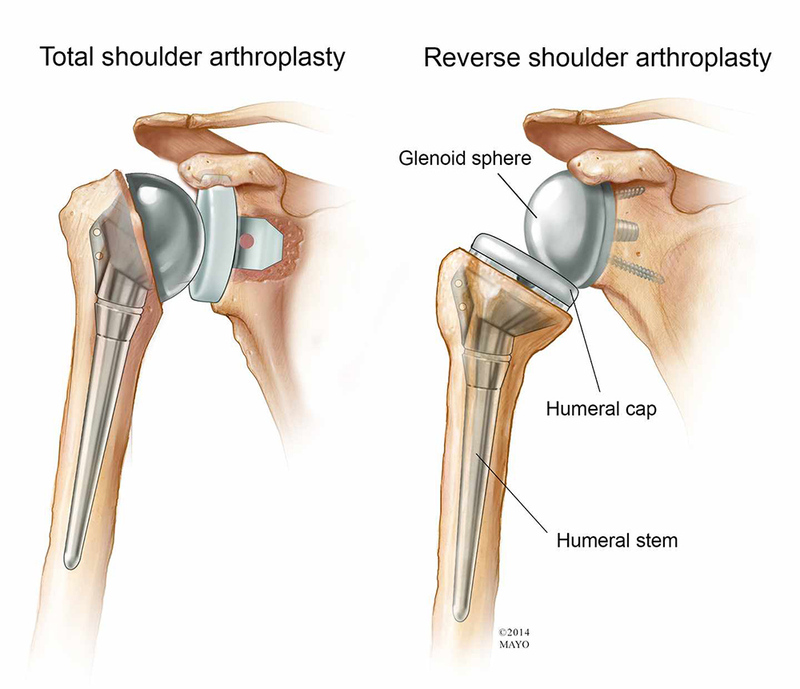 However, some glenoid morphology or patient age may make reverse shoulder arthroplasty an option. Patients with rotator cuff tear and poor function without arthritis (pseudo paralysis) may be a candidate for reverse shoulder arthroplasty. Also patients with arthritis accompanied by rotator cuff tearing (rotator cuff arthropathy, Milwaukee shoulder) are also good candidates for reverse shoulder replacement. Similarly, most cases of rheumatoid arthritis requiring surgery are optimally treated with reverse shoulder replacement if there is damage or loss of the rotator cuff. On the left is a standard (anatomic) shoulder arthroplasty. The components of the ball and cup are reversed on the right—a reverse shoulder replacement. Avascular Necrosis or Posttraumatic arthritis may affect the humeral head only, in these cases a partial shoulder replacement may be indicated. However, a complete replacement may be indicated if glenoid involvement is detected. A partial shoulder replacement on the left with replacement of the entire humeral head. Alternatively, replacement of only the area with arthritis may be possible in some cases. The right image shows replacement of both the ball and socket (glenoid).